First Aid Outfit - Aircraft. Approximately 20 x 10 x 18cm. These were carried in larger aircraft, the number of kits supplied depending on the number of aircrew aboard. 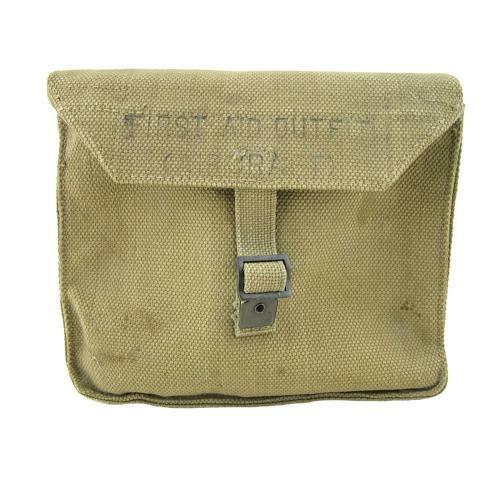 The kit was contained in this olive drab canvas bag with a friction buckle fastening. It was manufactured by the Mills Equipment Company and is clearly dated 1940. The contents of the kits varied depending on the the location it would be used in but most had a selection of bandages, dressings and so on. This example comes is empty bar a St.Johns tourniquet which was presumably issued with it. The bag is in very good used condition, the tourniquet shows use and wear. Stock code M23305.